The concept of Nomadic art of Eurasia is presented by the art dealing London-based Company Eurasian Art Ltd., established in 2004 and directed ever since by Michael (Menashe) Goldelman, an art dealer and an art historian of Russian-Israeli origin. In addition to buying and selling important artworks, Eurasian Art Ltd. also provides an expertise and preparation for the publication of the objects of ancient art that belongs to the nomadic cultures that once flourished across the steppe lands of the Eurasian continent. One of the chief goals of its activity is to locate and correctly identify authentic objects of ancient art now in Private Russian, Ukrainian, and Central Asian collections, as well as those in European and American collections. Although some of these pieces have been published and exhibited over the years, only a very small number have reached museum's collections. We strongly believe that the important objects of ancient art currently held in private collections must be presented to the art world so that scholars and public can enjoy these masterpieces of ancient art. As a result of the complete lack of the surviving local written sources and also due to the bad preservation of the organic materials in the ground, the objects of metalwork made out of gold, silver, and bronze remained the primary source for the study of ancient cultures and artistic traditions coming from the ancient and the medieval Eurasian Nomadic world. 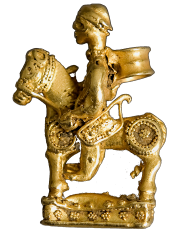 During the ancient times the Scythian and the Sarmatian tribes of Iranian origin were the chief masters of the Eurasian Nomadic world developing the unique "Animal Style" used to create the highly precious objects such as rhytons, sword scabbards, quivers, torcs, diadems, bracelets, and rings. Starting from the 5th century CE, the different waves of Great Migration coming from the Altai and Central Asian regions to the Western Eurasia, brought with them tribes of Turkic origin, such as the Huns, Avars, Bulgars, Khazars, Pechenegs, Kypchaks, Seljuks, and Mongols, who created their own artistic traditions. During this period not only the precious vessels, but also belts, sabres, and the horse harnesses of the nomadic elites became decorated at first with garnets cloisonné, and thereafter with floral, as well as animal and human images derived from the Sogdian artistic traditions that flourished alongside the Silk Road. The ancient nomadic artistic traditions survived until today in many cultures of different ethnic groups of Iranian and Turkic origin that lives both in the territory of the Russian Federation, - in the Caucasus, the Altai, and the Urals Mountains, and also in the Volga River areas, as well as in the lands of the independent Central Asian states, including Kazakhstan, Kyrgyzstan, Turkmenistan, Uzbekistan and also Mongolia. Thus, the current research of the ancient nomadic artistic traditions is not only relevant for the general study of ancient art, but also for the modern understanding of these peoples' cultures.